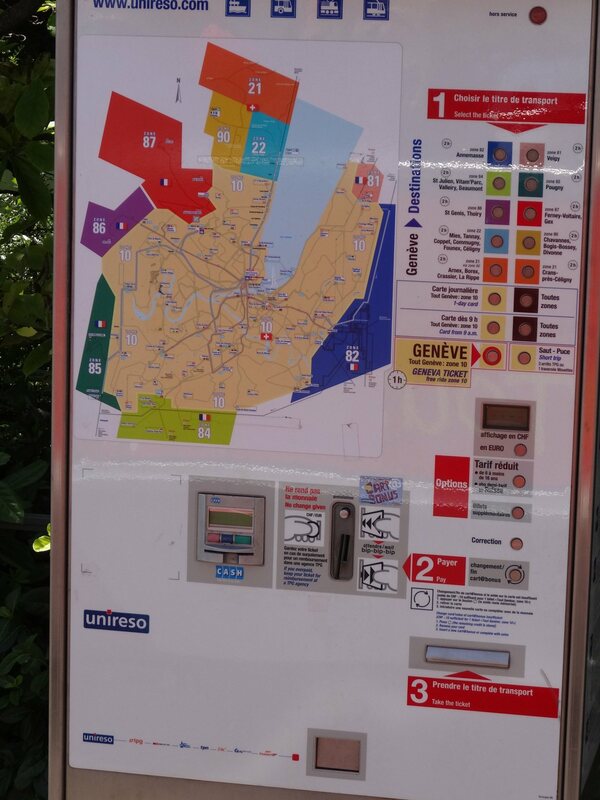 Geneva has a very good public transportation system that will quickly and conveniently get you to any corner of the city. The core of UNIRESO is TPG - Transports Publics Genevois, which operates local trams (6 tram lines numbers 12-17) and buses. Together with TPG, Unireso also covers yellow taxi boats driving through the Geneva Lake and SBB trains. With one ticket, You can use all ways of transport! See the map of public transport. The single UNIRESO ticket is valid for bus, tram, lake boat and local train (including Cornavin-Airport train) falling within given Unireso zone. The most common ticket is valid for 60 minutes and is transferable (CHF 3). Alternative is short 3 stops ticket (CHF2). Tickets are to be bought at the ticket machines (coins, no credit cards), located at every bus or tram stop in the city and inside the buses going outside of the city. As there are no ticket machines in the city buses, you are supposed to buy your ticket at the station before the vehicle comes. There is a date and time printed on the purchased ticket in a moment it's printed, so always buy only one ticket - the one that you are going to use! The general city of Geneva belongs to zone 10 (the biggest area in the middle of the picture above). Zone 10 also includes airport. If you are coming for the tourism, you will most likely be in this transport area only. Regular full priced ticket for zone 10 (60 minutes) costs 3 CHF and you can switch between buses, trams and boats. Short trip (3 rides by bus/tram or 1 ride by local boat - mouette) ticket prix is 2 CHF. For zones 21, 22 and 81-90 your ticket is valid for 2 hours. You can also purchase 1 month zone 10 TPG/Unireso ticket (valid for bus, tram, lake boats and train in the whole zone 10) at Gare Cornavin Railway Station or at station Rive (tram 12). At the Gare Cornavin, the TPG Office is located at the northern entrance (upper part of the station), just opposite the Geneve Roule! bicycle rental. Cost for one month Geneva public transport ticket zone 10 for adult is 75CHF and 45CHF for young people 25 years old or younger. You only need to provide Your ID, address where You are living in Geneva (or hotel address) and swiss phone (optional). They will take the picture of You on the spot and print the monthly pass immediately. There are also passes for longer period, up to one year, available and passes for other zones as well.